I am famous amongst my friends and family for being an overpacker. I can easily pack two suitcases AND a carry-on for a weekend getaway and STILL not find anything to wear. My loves, to whom I can admit things that I'm sometimes embarrassed to admit to myself. I’ve always known the importance of having good girlfriends, as well as the importance of being a good one back. Being a good friend calls for a lot more than shopping trips and bottomless mimosa brunches. Although many laughs are shared between friends, having someone to share your tears and fears with is one of the best parts of having good girlfriends. My friends were very supportive of my move to Ghana. They may not know it but there were many times when I wasn’t very confident in my decision but because they had so much confidence in me I worked through it and rose to the standard at which they held me and for that I am very grateful. Although it may seem cliche, my girlfriends were the gusts of wind beneath my wings that helped me soar to Ghana. Before I got to Ghana I was looking forward to finding my tribe. I was looking forward to finding community of ambitious, like-minded young Ghanaian women to bond with, but it seems like I’ve only been met with silent judgment filled stares and bottom to top sizing ups sharp enough to cut through any hopes of friendship. I just know that somewhere in this country there are communities of ambitious, like-minded women just waiting to be found, but I until I find my tribe I am glad that there are still a few New Yorkers in Ghana on holiday. So rather than building bonds with the women of Ghana I’ve been building and solidifying bonds built via friend of a friend connections as well as social media. One of the many things I miss about the states is female bonding, the ability to receive a genuine compliment in a fitting room without any underlying or underhanded insults attached. 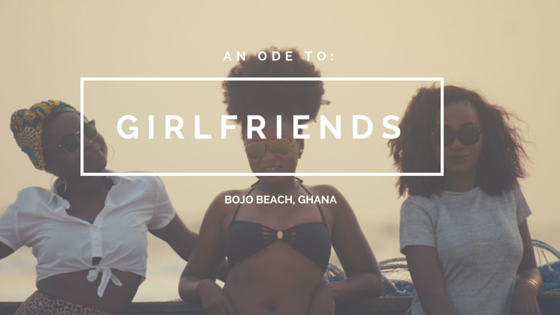 For a dose of some much needed female bonding I met Rose and Jackie for a trip to Bojo Beach, which quickly became one of my favorite places in Ghana. The scenic, serene beach provided a quiet change from all the noisy beaches I have encountered so far. Despite a few hiccups like getting sand stuck in my contact lens (which later created an ulcer on my cornea) it was a refreshing experience. Bojo beach is the perfect place to catch up with friends, or a date on a quiet Sunday. It is also home to one the most amazing sunsets I have ever witnessed.